We’re back to fish recipes this week and today I’ll share the long-anticipated spaghetti with white anchovies recipe. This is not a family recipe but, I have to admit, it should be. There’s no doubt in my mind that all the adults in my family would have really enjoyed this pasta. And like so many of the pastas they served, it’s easy to make, requires few ingredients, and is ready in minutes. What’s not to like? This recipe came about clearly by chance. Last Fall, I happened to overhear a cooking program in which Michael Symon used white anchovies in a pasta dish. Never having seen white anchovies, I didn’t think much of it. Then, around Christmas, I found a two-pack of white anchovies at one of the big box stores. I bought them, went home and started working with them, using my aglio e olio recipe as a base. It really was that simple. As you’ll see later when you read the recipe, this is another dish you can have on your dinner table in 30 minutes, tops. And if you’re at all like me, it will find its way to your table more often than you now think possible. The anchovies I found that day — and continue to use — are not only white but are far less salty and “fishy” tasting than the anchovies one finds in the small tins. These differences make them perfect for this dish and, as you can see in the photo bellow, white anchovies actually look like fish. Imagine that! The recipe calls for 6 whole anchovies but, truth be told, I normally use 8 or 10 of the little fishies when I make this dish. Yes, I really do enjoy them. I suggest that you taste one upon opening the package to see how it tastes before you decide how many to use for a pound of pasta. As is the case with any of these aglio e olio pastas, time is of the essence. You want to time it so that the anchovies, garlic, and oil “sauce” is ready when the pasta is 2 minutes shy of being al dente. Don’t worry. It’s easy enough to do. And remember: whenever you prepare a pasta, always reserve at least a cup of the water used to cook the pasta. It has saved many a dish for me. In a small mixing bowl, combine bread crumbs, lemon zest, and 2 tbsp of olive oil. Season lightly with salt & pepper. Mix thoroughly. In a small frying pan over med-high heat, lightly toast the bread crumb mixture. Do not allow to get too dark or it will ruin the dish. Remove from heat and set aside. In a large frying pan over med heat, add the remaining olive oil. Once hot, add garlic and red pepper flakes. Sauté for 1 minute. Add the anchovies to the pan and continue sautéing until the pasta has cooked 2 minutes less than the package’s cooking instructions indicate for al dente. If you’ve timed everything correctly, the anchovies should be sautéed for just a few minutes before the pasta is ready. Add capers and pasta to the pan containing the anchovies. Gently toss to evenly coat the pasta with the anchovy & oil mixture. If too dry, add enough pasta water to create a sauce. Continue to sauté until the pasta is al dente, 1 to 2 minutes more. Remove from heat, add 2/3 of the bread crumb mixture, and toss. Place on a serving platter and garnish with remaining 1/3 of the bread crumb mixture. This recipe is so basic and with so few ingredients that there’s little room for variations — or so I thought. In a comment written after last week’s cannelloni post, the Kitchens’ good friend and fellow ravioli maker, Spree, mentioned adding bits of preserved lemon to this dish. Though I’ve yet to try it — still working on corned beef sandwiches here — I will soon, no doubt about it. What’s this? You don’t know how to preserve lemons? Well, neither did I until I saw Spree’s post of January, 2012. Now I use it exclusively to make preserved lemons and you can learn how to do it, too, by going to Spree’s wonderful blog, Cooking-Spree. While you’re there, be sure to look around. You’re in for a treat! I have yet to find white anchovies in packaging smaller than shown in the image above. In fact, it was while trying to do so that I mistakenly bought the sardines that led to my sardine and pickled pepper recipe of a few weeks ago. I have seen an anchovy salad at one of the groceries but, now that I want to buy it, the salad has disappeared from their “fish/seafood bar.” If I do find some in more convenient packaging I’ll mention it in a post and come back here to announce it. Be very careful when toasting the bread crumb mixture. If too well-browned, your pasta will have a burnt toast flavoring that isn’t at all desirable. Take the crumbs off of the heat as soon as they begin to have a golden glow. I used homemade spaghetti with this dish but you can use any of the similar pastas — i.e., linguine, fettuccine, trenette, tagliatelle, etc. I’ve mentioned that we ate lunch at home throughout the school year, a consequence of living so close to the parish school. I also said that when the weather turned cold, we would often find a bowl of soup waiting for us to walk through the door. One of those soups Mom prepared and today’s Blast from the Past is Stracciatella. Requiring few ingredients and ready in minutes, this soup is just about as easy to prepare as that stuff in a can — but, oh, so much better. You can see the recipe by clicking HERE. This entry was posted in Pasta/Rice/Soups (Primi Piatti), Seafood (Frutti di Mare), Vegetarian and tagged Cooking, Food, Italian, Pasta, Recipes by ChgoJohn. Bookmark the permalink. Such a nice comment to leave, Debra, and I’m very appreciative. This is a great recipe and so simple. It has become my “go to” pasta dish, for now anyway. I like being able to get my dinner fully cooked and served in under 30 minutes. It removes any temptation I may have to call and order something or head for a drive-thru. I envy you your lemons. Just yesterday, one of my groceries had more Meyer lemons and today I started another batch of Limoncello. I’ve got the juice freezing in an ice cube tray. I’ve no idea how it will be used but I’ll think of something! Again, thanks for the wonderful compliments. Get out of my head, Young Man! Seriously! I was just thinking of going back to the store, buying up the rest of their Meyer lemons, and using them to double the batch of Limoncello and to make a chess pie. Too funny! I’m so glad you like what you see. And I can so identify with the 200 g package of anchovies. The only place I’ve found them, so far, makes me buy TWO 200 g packages. Yes, I’ve been eating a lot of this pasta, of late, too. You gotta love simple recipes that you can put on the dinner table in 30 minutes. What’s not to love? Lovely post John, thanks for sharing. I so agree with you, Anne. I always fight the urge to order something and have it delivered. A meal like this not only will get on the table before the delivery man hits the doorbell but it will taste better than just about anything you can order. Thanks for commenting. Great post, John! I have to try pasta with ‘briciole’ because to my shame I have to admit that I haven’t tried it yet. Not sure if I can get white anchovies. In the photo they remind me of anchovies in vinegar, is that what it is? I just checked the packaging, to be sure. These are packed in vegetable oil, wine (I assume white wine), vinegar, and parsley. I’ll update the photo caption for everyone. Thanks for the heads-up. I love these simple pasta dishes John. In fact, they’re sophisticated in their simplicity! Haven’t eaten this one for years and I really should in Spain with anchovies beign so easily available and not too expensive. I’m, just off to London for a couple of days as my mum is in hospital for a little op…so it’s me and Papa together creating havoc in the kitchen. Maybe I should make him this to cheer him up?! Thank you, Tanya, and yes, cook something to lift your Papa’s spirits. If you can get him involved in the process, it may provide you both with some fun — and a little distraction, too. This dish is so reminiscent of the way they all cooked back in the old two-flat, even though they never made this dish specifically. Simple yet flavorful. That’s the key. Sending Mum positive thoughts and pray that all goes well for her. Thanks John…all went well and she’s now back home and resting! Very glad to hear that, Tanya. You know I’ve been waiting for this recipe all week, been a good girl and not moaned (too much). Consider this tomorrow nights meal when I get home. I like your addition of the bread crumbs too – hadn’t thought to do that. The white anchovies you mention had me pondering for a while, but I realised they are the ones I can buy most easily. Either in France from a deli they come in a clear plastic tub and are really for appetisers, and at home in Hastings where I can get them from the deli counter of my fish shop – they come in a oil/vinaigrette and are outrageously delicious/melt in the mouth anchovies, plus I can choose the amount I want to buy – like a small scoop/tub). happy days John!! and now I’m waiting for my halibut with mushrooms……. Glad to oblige, Claire, and thanks for leaving such a great comment. I wasn’t sure if you were talking about the same anchovies until you described them as being “outrageously delicious”. Yep, those are the ones. They should come with a pasta recipe on the package! The use of bread crumbs is something that’s customary in the South of Italy, primarily Sicily. (Ambrosiana verified this for me.) It’s used primarily on seafood dishes where the use of cheese is frowned upon. Another ripper recipe John! This looks lip-smacking. One of my favourite Melbourne shops is the imaginatively-titled Mediterranean Wholesalers, who stock gorgeous white sardines. I also have preserved lemons in the fridge (my neighbour keeps me well-stocked), so this is going on the must-try list. Looking forward to the halibut too! Thanks, I’m glad you like today’s recipe. I so would love that Wholesalers place. Maybe it’s a good thing we haven’t got one here. I’d go broke! How lucky to have such a steady supply of preserved lemons. My last batch used Meyer lemons but I think I’m going to make a batch with ‘regular” lemons, just for comparison purposes. Thanks, Glenda. I found them on a refrigerated shelf, next to — get this — platters of sushi. I had to buy two, 200 g packages. I’m looking for a smaller package because as much as I love ’em, I’ve been eating quite a few white anchovies lately. I am not an anchovies lover. Never heard of the white ones. Your recipe and photos look so good I am willing to try it. I will file this away and be on the lookout for the white anchovies and when found I will give it a try. OH good, we have one nearby. Hmmm I wonder where I can find them out here. This is my kind of dish, simple, flavorful, satisfying. Next trip to CostCo, we’ll each take a package. One is more than enough. This is an absolute favourite of mine. Anchovies, chillies and capers are such a good mix of flavours. Lovely recipe. Thanks, Roger, and I so agree. Finding those anchovies was really a lucky break and I’ve taken full advantage of it. I love the simplicity of this dish. It never fails that I get dinner started right when the family starts belly aching about how hungry they are! A quick dish a necessity! Thanks, Tanya. The flavors of this dish are great, but, I have to admit, if it took an hour to prepare, I wouldn’t have it for dinner nearly as often. The thing is, the 30 minute time limit is being very generous. It takes longer to boil the water than anything else. This is my kind of meal! Spring Greetings from snow covered Hudson Valley!!!!! Love simple and flavorful dish This dish requires just a few simple ingredients but sure pack a lot of flavor. Will look for white anchovies when I visit the food market. 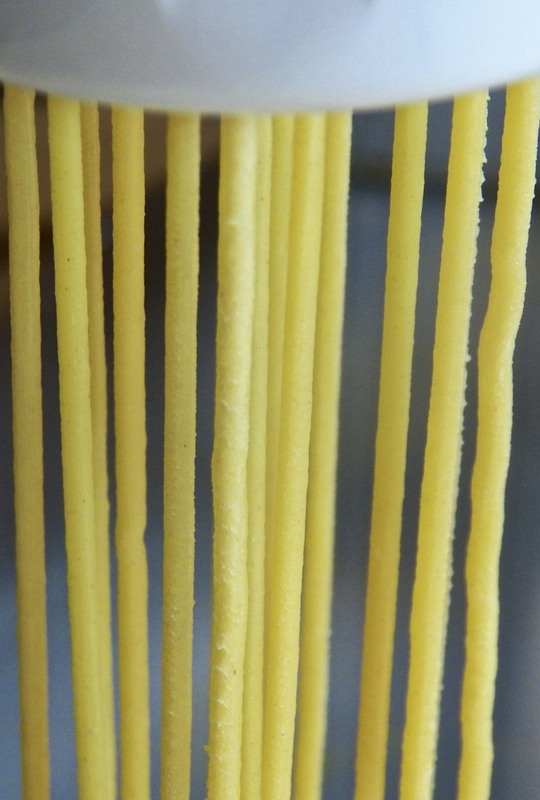 Question: you used homemade spaghetti which is fresh, is the 1 pound of pasta called for in the recipe fresh or dried? Goodness, Norma! Winter is really socking it to you guys this March. Hang in there. Spring is coming, whether or not it looks like it right now. It was a pound of fresh, Norma. I believe the ingredient amounts will work for both pasta types, just remember to reserve some pasta water for use if the pasta is too dry. there you go, pleasing an 89 year old lady! Wow! If that isn’t good news. Your Mom obviously has exquisite taste! I hope you’re having a wonderful time, Sally. Enjoy your visit. 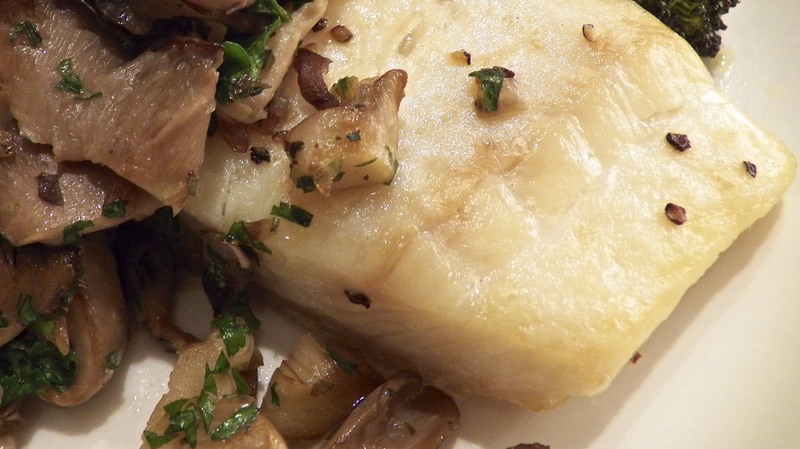 It’s-a-coming … both the halibut and Spring, although, right now it’s 15˚ outside. Yikes! Thanks for dropping by and commenting. We who dream of pasta first thing in the morning need to stick together. You know, I used to think I didn’t like capers before I really understood what they are. I love putting them in pasta dishes now – such great flavor. Speedy pasta dishes are so handy and I agree with you – it’s difficult to convince yourself to eat the terrible stuff from the drive-thru when you can whip up something homemade in no time at all. Any more hints on where you’re finding the anchovies around here? Hey, Susan! Aren’t capers the best? They remind me of using fresh corn kernels in soup or chili. Both give you a pop of unexpected flavor. I got them at CostCo where they sell the big platters of sushi. I normally shy away from posting names of places but I’ve already said it enough times in the comment section that I may just go back and update the post. Thanks for dropping by and commenting. No need to read them all. If I can answer your questions, I’ll gladly do so. Being these anchovies come in a two-pack, maybe you can split them with your friend. Believe me, that’s a lot of anchovies if you cannot share! That first photo John, makes me think you took it outside, it’s just so fresh and really gives an impression of a bright sunny day. Not to mention how incredibly tasty it looks. The lemon sounds like an incredible addition too. And I do have white anchovies in the fridge (I can buy them in a jar from a local restaurant under their own label http://terroni.com). I know I’ve said this a million times by now, your recipes make me absolutely want pasta back in my diet but sadly my wallet can’t afford another wardrobe ;-)! Oh, I have taken plenty of shots outdoors in Winter, Eva. Not so much this year, though, since it really has been a dismal season. Sorry about all the carb-loaded recipes. I hope you’ll find next week’s recipe more suitable. Thank you for the links. I found these anchovies at CostCo but I don’t need to buy such a large amount, that’s for sure. Unbelievably, my Italian market had fresh sardines last week. I already had meals planned and couldn’t use them right away but it’s good to know that the market may have them. Until then, I need to take a “voyage of discovery” and check out the stores in that Tribune link. One place is situated along the way to the Italian market. Oh boy! Thanks again and I hope you have a great day. The simplicity of this fabulous dish! It looks so good, I love it John. Now, that my son is back to soccer practice twice a week, I need quick meals and pasta always fits the bill. Thanks! At the risk of sounding really antipatica and who-the-hell-does-she-think-she-is(! ), I have to tell you that there are no such things as ‘white’ anchovies. And that the other anchovies that you all berate so much for being too salty or whatever, are actually suffering from the problem of being badly processed and packaged. Anchovies are NOT salty in and of themselves. Salt is added to them. And salt is what preserves them. So … all you need to do is remove the salt from them to taste their deliciousness. 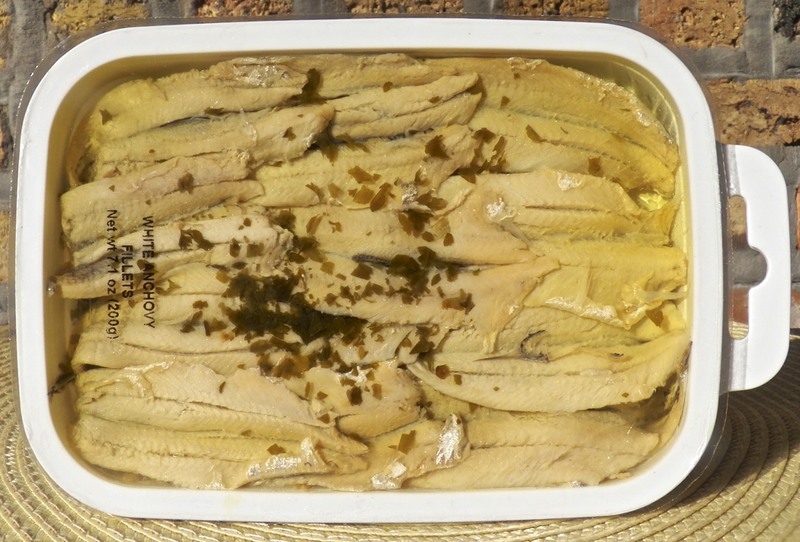 If you buy fresh anchovies … and allow them to rest in some ice-filled water for 30 minutes … that will turn them white. Then you remove them, sprinkle salt and lemon all over them … and allow to rest (maybe in the fridge) for another 30 minutes. Wash and pat dry: and voilà …. you have ‘white’ anchovies! Pour olive oil over them and add parsely and a bit of garlic too if you like … and serve as an antipasto. Funny…..I have just discovered anchovies. I have never had them before, and I have been thinking to buy some to try them out. And here comes this simple and delicious looking recipe!! The dish looks so fresh and mouthwatering that I have to bookmark it. I have to go back to the store and check whether they are white. Thank you so much. I’m sure you could use “regular” anchovies in this dish, just be aware that they are stronger in taste and often more salty. Depending upon your own taste, you may wish to use fewer fillets than I specified in the recipe. By all means, though, if you can find white anchovies, give them a try. Good luck in the hunt! Another stellar post, John. I love the plated pasta photo (say that three times fast 😉 ). I have never tried white anchovies so this will be something new. It sounds and looks absolutely delicious, as I’m sure it was. Thanks, Richard. I fix many pastas and, I must admit, this one has become one of my favorites. Quick and easy to make and it packs a great mix of flavors. I hope you can find white anchovies and give it a try. I love these simple pasta dinners. You offer so much variety in prep time – from a simple pasta dish like this to a 2-day preparation for ravioli. But that’s exactly what you need – food to suit your schedule. The best thing about a recipe like this one is that you can have all the ingredients in the house (particularly in the summer when there is parsley in the garden). It is always nice to be able to muster up a great meal when the refrigerator is getting bare and there is no time to shop. Oh, and I checked out Spree. Anyone who makes preserved lemons (which I love) captures my interest 🙂 So thanks for the tip. Thank you so much. Time is always the great determinant for me when it comes to many recipes. That’s why I have 2 “ravioli days” a year; 1 sausage day; a cannelloni day, etc. Make enough to last a good while and move on. You and I are of the same mind, too, when it comes to being able to prepare a good meal without making a run to the market. This dish, as well as the pasta with sardines recipe of a few weeks ago, really come in handy, especially on those evenings where you’ve only time for a quick meal. I’m glad you found Spree. She has a wonderful blog. I’m so glad you liked this recipe and thank you for being so complementary. For me, white anchovies were “the find” for 2012. I really have enjoyed them and this pasta is just too easy to make. It’s embarrassing to admit how often I’ve prepared it. Thank YOU for the preserved lemon how to. I made a large batch and have given them as gifts. I will definitely place a jar in this Christmas’s gift baskets. I’ve not seen white anchovies in stores, although I admit I haven’t looked, either. But I will! This is a wonderful sound dish. And I love any dish in the aglio e olio line, so I know I’d like this (particularly since I do like anchovies!). Very creative – thanks for a dish that’s totally new to me. Ah! So you know what I mean! These are fantastic, Giovanna, and I’m happy to have “discovered” them. Thanks for the nice compliment. That looks delicious! I was going to say the same as Giovanna above, that the anchovies look like Spanish boquerones – anchovies that are salted for several hours before marinading in white wine vinegar and garlic. They are often served as a tapa with a drizzle of olive oil and parsley. This does look so tasty & as it turns out, I had already put anchovies on the grocery list for this weekend. No idea really what I was going to do with them but wanted some on hand. However, now I’ll be on a quest to find white anchovies. I always learn something new every time I visit your blog…and it’s always good! Thanks so much, Diane. I’m still trying to fine a more conveniently sized package of the little fishies. When I do, I’ll definitely post the brand for everyone. As it is, I have to buy 2 packages totally 14 oz (400 g). That’s a whole lotta anchovies for one person! Either I find an anchovy-loving friend or I take out an ad on Craig’s List. Well, I’ve seen stranger things on Craig’s list. 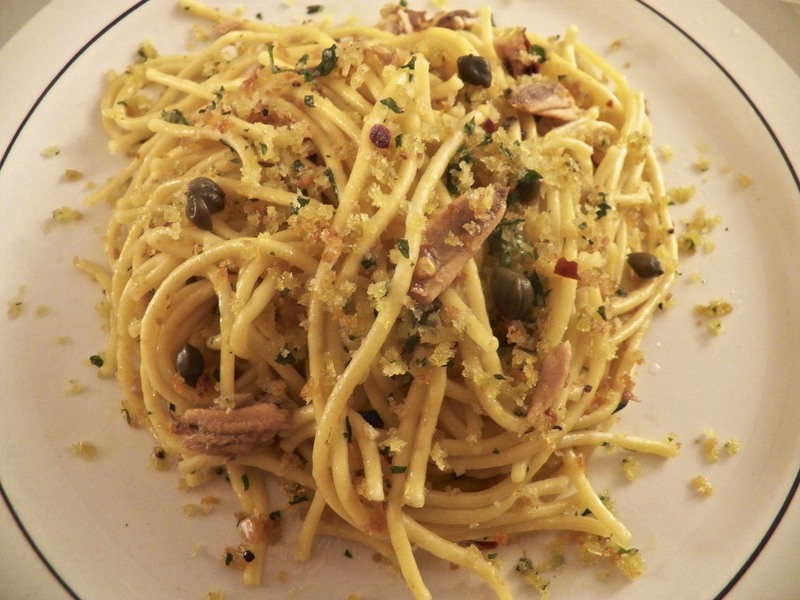 This really looks so good with the capers and those breadcrumbs…I’m going to be on the lookout for white anchovies. And I have a bag of Meyer lemons I need to use and love the idea of a Meyer lemon chess pie! Do you think you might make one soon? As always, a fun and tasty post, and I need to go check out how to preserve lemons on Spree’s site. That was posted before I “discovered” her! Again, Happy Spring! Thanks, Betsy, and happy Spring to you, too! I just bought a bunch of lemons but all of the zest is being used for limoncello. I do have 2 ice cube trays of Meyer lemon juice, though. I will be making that lemon chess pie, one way or another, soon! I’ve seen a number of preserved lemon “how to’s” but Spree’s was the first I pinned and I trust her recipes implicitly. It’s really a simple thing to do, just takes time to let them “cure.” I look forward to seeing how you use your preserved lemons, once you get them made. Not much I can say that has not been said above John. Lovely post, so packed with great stuff. Very impressive. Thanks, Conor. I’m glad you like the post. Thanks, Greg. I hope you can find the anchovies so that you can make this. Love the look of the recipe but, to the best of my knowledge, have never seen ‘white’ anchovies as pictured before: herring fillets in similar packaging, yes? From a Melbourne comment obviously available in Australia . . . I do use anchovies in oil from little oval tins, but my main purchase is always the ones with heads and tails on and entrails intact in glass jars: about 10-12 per jar: in strong salty brine, no oil in sight. Northern Europeans oft use them daily on their morning sandwiches on top of hardboiled egg or cottage cheese. Well, a learning experience again whichshall be followed up 🙂 ! And, John: unlike some on the blog, I never did think they came ‘white’ from the sea 🙂 ! Obviously prepared in a certain way and named after the method! I remember our family first coming to Australia and Mom asking for ‘anchovies’ from the grocer – well, those who kept them handed Mom the small oval tin of fish in oil we had never ever sighted: I know Mom at the time thought the locals total idiots foodwise 😀 !!!!!!!!!! Am laughing! Have looked up about 6-7 Estonian dictionaries [yep, am a stubborn cuss!] re ‘anchovy’, ‘white anchovy’! The books were printed from 60 years to 10 years ago! Nothing about the ‘white’ one, but I could not believe our ‘kilu’ could be anchovy, sprat, brisling or sardelle [!] depending on the book! You made your point 🙂 ! Not surprised the spicy anchovies in jars/tins may be unknown. I try to have a small footprint, but have to buy either Swedish [the best], Finnish, Norwegian or Danish ones – noone else seems to spice these beauties nor appreciate them!!! Thanks, Eha! I, too, have seen the herring fillets of which you speak. These are much smaller, as you can imagine. I’ve not seen them jarred, though, and the ones in small tins are not the same as these. To be honest, I’d use those in this pasta dish but few others would. Too fishy for most. These whites, though, are just right, making one flavorful dish of pasta. Grazie, Stafano. I’m pleased you enjoyed the recipe. I like anchovies any way I can get them, though the brown ones you described can overpower a simple pasta like this one. The white anchovies, on the other hand, are perfect, giving just the right amount of flavor without drowning everything else. Me, too, Michelle. Me, too! John, I love the idea of this pasta with anchovies in the sauce – sounds so tasty. Just need to convince the Culinary Enthusiast to try it 🙂 but it sounds like the white anchovies would help with that. I’m just not so sure I can face the capers though; no problem, I’ll just leave them out! I’m excited to try this recipe! Happy Spring. Hope the Chicago thermometer is on the rise. I will share this one with my sister, too as she is the anchovy fan in the family. I like the photos of the close up of the pasta being made and the dish looks wonderful. I’m going with the soup! We need it on this wintry Spring day. Happy Spring to you, too, Ruth. Our temp right now is 19˚. We should get above freezing tomorrow, a far cry from the 80 degree weather of last year. Thanks for complimenting the post and I hope you do try the soup. It is so easy to prepare and makes a great lunch on a wintry day. Love pasta with anchovies. This recipe looks so delicious. My wife makes pasta with olive oil and anchovies with bits of herbs and they are already yummy. Great post Bro. Thanks, I’m glad you enjoyed the post. Your wife knows what’s going on. Pasta with anchovies is the best! I too have never heard of white anchovies. My dad absolutely loved anchovies. You’ve reminded me that I haven’t had any since he passed away… my family does not like fish! I should me this just for me, in honour of my father! Sorry to learn that your Father is no longer with you, Lidia. Too bad that there are no fish lovers in your family. You’ll just have to make this for yourself. It will be your very own, secret pleasure. I hope you can find the white anchovies and, when you do, make yourself a big dish of this pasta. You know your Dad will be watching. Wow! It took a long time to get to the bottom! What a popular dish. I’ve tried chopping anchovies and “melting” them into the oil. Now I’ll have to get daring and leave them in pieces. 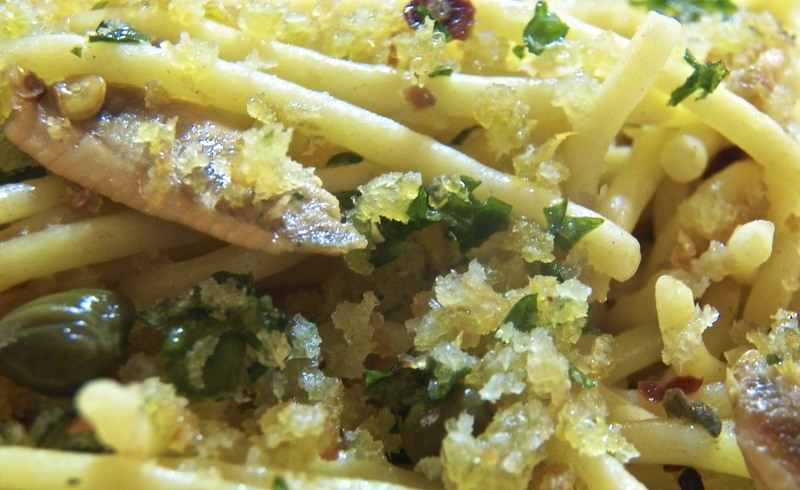 My husband and son love anchovies and I love aglio olio so this is must try! You are a mench! Ha! Although I think ‘regular’ anchovies would work here, though with a bit more flavor, if the men in your life like anchovies, they’re going to love this dish. I hope you can find white anchovies, though. They’re not just more mild in flavor but the fillets are a bit more firm, so, they won’t dissolve so quickly when sautéed. I love dishes that are quick to make and ready in a minute. And I love sneaking in a bit more fish into our diet. It is so easy to stuck eating salmon (even though it is a favorite at our house) I would love to explore the use of other fish. Thank you for sharing and giving me a few ideas next time I go grocery shopping! You’re very welcome. I imagine that you have quite a selection of fresh fish available in your markets. This recipe could be adapted for any of them. Anything to get the kids to eat more seafood! This is such a simple recipe but totally relies on the quality of ingredients…lovely. Thank you, Karen. That’s a very nice comment to leave. You pretty much described the best things about Italian cuisine. It needn’t be complicated to be good. Mom, also, told a few fibs in order to get us to eat something, though, truth be told, I was open to trying just about anything. I doubt if you’d need to lie about white anchovies, though, Barb. They’re certainly less “potent” than their darker versions and blend nicely with the other flavors in this pasta. And all of it done in under 30 minutes. You can’t beat that! Wasn’t that dish of pasta Spree put together something? I’ve put black pasta on my shopping list. Surely there must be some here in Chicago somewhere. I’ll surely find it, if there is. capers + salty food, Tasty! john, i wonder why do sometimes italian like to add some breadcrumb to the pasta??? It is not customary to use cheese when the pasta contains seafood. Many believe that the cheese will overpower the seafood’s delicate taste. So, in the South of Italy, they will toast seasoned bread crumbs to garnish their pasta in place of grated cheese. Thanks, Geni. I do think you would like white anchovies so much better than the brown ones. Though I like them both, the white are so much more milder and work very well in a dish like this — without overpowering it. OOHH I’m going to give this dish a try later in the week. We have fresh, white anchovies readily available at any fish counter here in southern Spain – and they are quite a cheap option, too. Glad to have you back! I cannot get fresh anchovies — not yet anyway. I need to seek out one of the major fishmongers downtown one of these days. I do hope you’ll enjoy this pasta, Marianne. It’s quickly become a favorite around here. I LOVED the line that it wasn’t a family recipe but it should have been. I have said that a few times myself 🙂 Lovely dish and I agree with you. Thank you, Maureen. I can’t wait to bring this dish home with me for my next visit. My Zia will love it! Ooh, another good one for Favourite Husband, especially after we’ve had a busy day. A good tip about reserving a cup of the pasta water. It’s saved many a pasta dish for me too! This dish is perfect for a busy day. It really is ready i minutes. I’m sure your Favorite Husband will love it! Thanks for the link to a fellow Portlander! Okay, you twisted my arm. I’m going to invest in a pasta machine 🙂 I’m thinking of getting a Marcato Atlas 150 although the thought of having my Kitchenaid stand mixer put its motor to work is appealing, I’ve heard that the little plastic thingies in the pasta attachments can break not infrequently. Any thoughts? Why, yes I do. First the good news. I own a Mercato Atlas 150, having bought it about a dozen years ago. The part that cuts the pasta noodles is interchangeable, a really nice feature. I bought another size “cutter” (for trenette, a pasta that is a shade thinner than linguine) and use it frequently. That gives me 3 cutters for pasta. You can see all of the Atlas 150 pasta cutters here: http://www.marcato.net/mod-ContentExpress-display-ceid-23.phtml . Now the bad news. I also bought the ravioli maker attachment, though I am not nearly as pleased with it. The dough must be thicker than what my family is accustomed to eating. If the dough is as thin as we use, the sheets do not stick together and the filling over-runs each raviolo. Now for the good news again. I bought the roller attachment for my Kitchen Aid. I love this attachment. I use it now to roll all of my pasta dough. I even bring my KA mixer and this attachment when I visit Michigan and use it when my Zia and I make pasta together. I never bought any pasta cutter attachments because I already have the 3 with my Atlas and the Atlas has a much larger selection. Now for more bad news. I also bought the KA ravioli attachment and found it to be about as bad as the Atlas version. Again, it is a question of the dough sheet thickness and personal preference. Congratulations! Does yours have pasta cutter rollers? Great if it does but they’re not necessary. You can easily cut the noodles yourself, at whatever width you want, with a knife. Just follow the instructions for making strozzapreti but skip the last step that twists the pasta. If yours has the cutter rollers, it may take you a few times to get the feel for the dough. If it’s too wet, the noodles will stick together once cut. If too dry, it will be quite hard to feed it into the rollers. Now, when the dough is too wet, you can sprinkle some flour on it to dry it a bit. If it is too dry, well, good luck. You may have to cut it by hand. I got the white anchovies, They are sold loose in the deli section of a shop I frequent often. I have just never noticed them before. Hi John, I made your recipe. It was very nice. The white anchovies were amazingly mild. I like them very much. Thanks for giving us the heads up on them. Thank you for coming back to tell me the good news. I’m with you. This pasta hits all of the right flavor notes for me. I just enjoyed a version of it for supper tonight — again! I hope you enjoyed the Stracciatella. It is one easy bowl of soup to create but a very good one, at that. I found white anchovies at a specialty grocer downtown Seattle this past Christmas, and promptly put them away to use at a special meal at a later time. Until i saw your post I forgot about them – now I have a wonderful new recipe to try! That’s great, Claire. I hope you’ll like them with this pasta as much as I do. Please let me know what you think. Thanks. Well, I think you have solved a mystery for me. There is a type of small fish here that is eaten either fried or marinated; Greeks call it “gavros” and it is often translated as anchovies. However there is also another word for anchovies in Greek, and that is “antzouyies”. I could never understand the difference. Now I suspect that gavros is actually white anchovies! Very popular here and veeery tasty! This is dinner tomorrow I think!! Thanks! John, I have 4 words to say to you. Damn that was good. Found the beautiful white anchovies today and made this dish tonight. Followed your instructions to the letter. Absolutely delicious. Both my boys loved it too (omitted the capers in theirs though – didn’t think they’d fall for the ‘special pea’ line you suggested to Barb)! This recipe is a keeper. Mmm, that’s delicious! I had learned to cook while living in Italy, so reading your blog feels, in a way, like coming home! I sort of forgot about fish& vine pasta, so it’s a great reminder! I didn’t know of the bread-crumbs variation, so i am definitely going to try it next time! Oh, and this advise is really worth of gold: “always reserve at least a cup of the water used to cook the pasta.” Thank you for sharing your magic with us! If I ever get to it (I currently have a backlog of posts), I’ll post the pasta with kale and link back to your bread crumbs. Why but canned white anchovies? Italian groceries like Carfagna’s in columbus carry then fresh. Buonissimo!